Tumblebears has just opened a fun play and PARTY VENUE! I am picturing back to when I was on maternity leave, especially after baby#2, when it really felt there was nowhere to go for a cuppa and a catch up with friends. Nowhere where baby would be welcome plus my toddler. Nowhere I could relax where someone else could give me a few minutes of respite and look after my kids so I could actually finish my cuppa and a full sentence of conversation. Nowhere I really felt my kids would be safely cared for and entertained… BUT NOW THERE IS!!!! A brand new play, activity and PARTY VENUE has just opened up in Lakeside in the Pick ‘n Pay shopping centre. 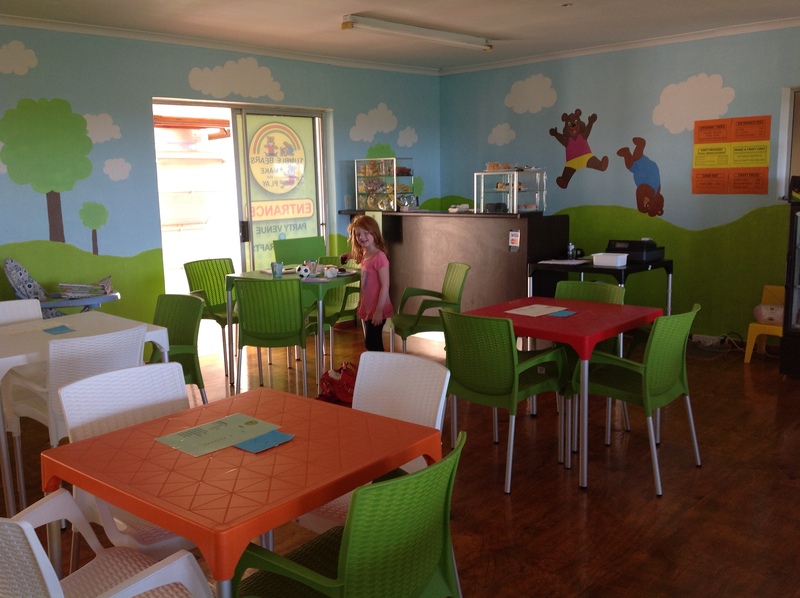 Tumble Bears Make and Play opened last week and has already had a very successful first week. It caters for kids from baby to about age 5. I took my 2- and 4-year old along over the weekend to sample what they have on offer and they fitted their target age group perfectly! Upon arrival we were greeted by friendly faces of the staff so eager to take the kids around and have some fun. My boy was young enough to enjoy the “baby” area (age 0-2) with great age appropriate educational toys, ball pond, etc. And it was fenced off so he was kept safe in that area, with his own child minder looking after him. 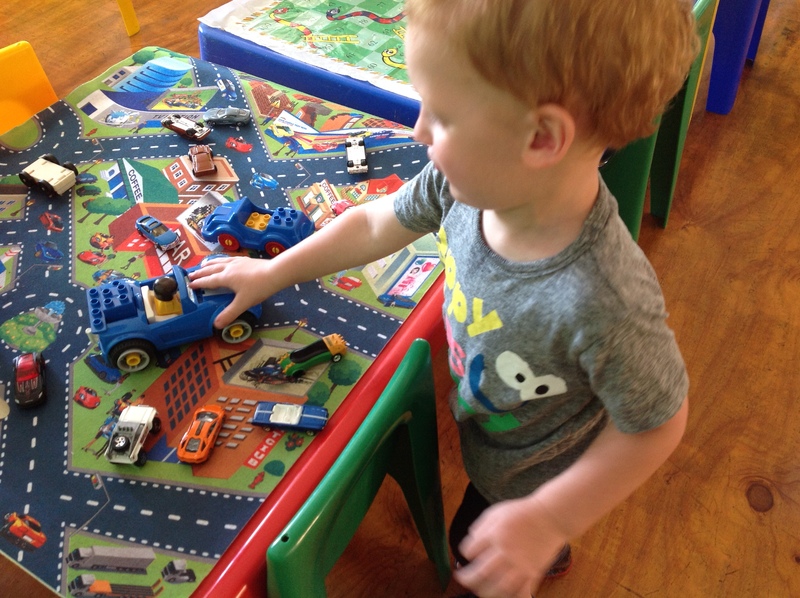 He was also old enough to enjoy some of the activities, he particularly loves cars, so he found this rather fun! The venue is perfect for arts and crafts and there are several sections set out for the kids to draw, paint, do sand art, etc. This activity centre is linked to the Tumblebear gym program that is popular at many Southern Suburbs pre-schools, and this gym program is now also available at this new venue in the mornings during the week. The classes expose little ones to sensory touch and development and help develop a bond with mother and baby or baby and carer. 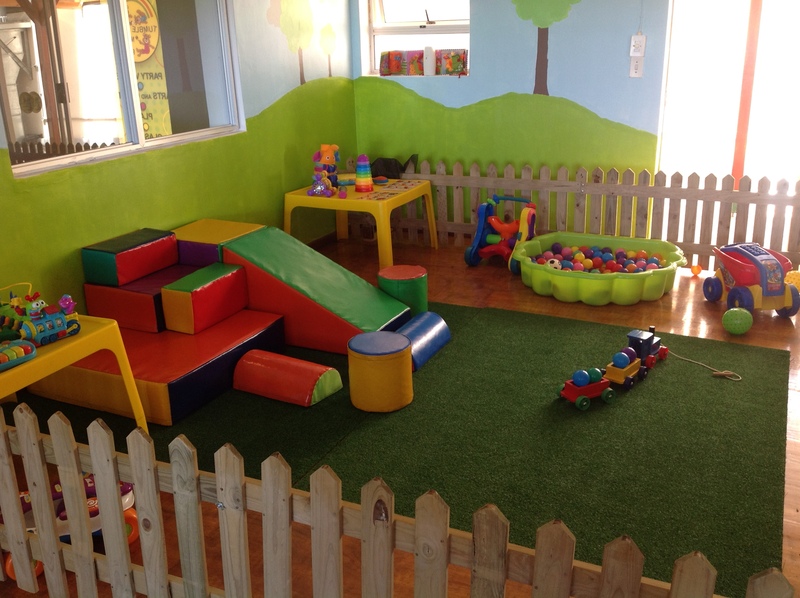 They have a section of soft play equipment that is perfect for creating an obstacle course. I was immediately drawn to the coffee shop area, which is close enough to keep an eye on your kids, but far enough away to have an adult conversation knowing the staff was looking after your kids. The coffee shop offers a variety of tuckshop items (chips, chocolates) as well as cakes, muffins and coffee to give moms that boost of energy they desire. 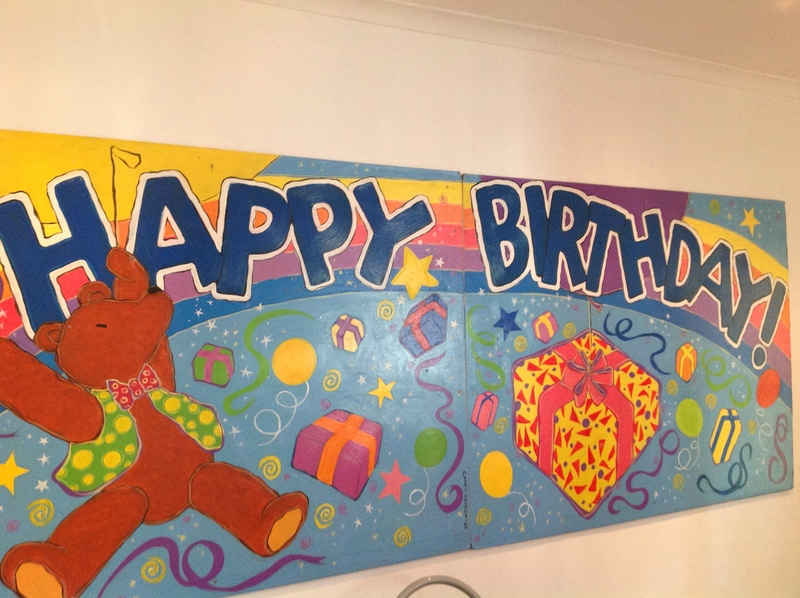 The main draw-card for me was that this venue offers BIRTHDAY PARTIES and almost every second client of ours is looking for a special place for their child’s birthday. 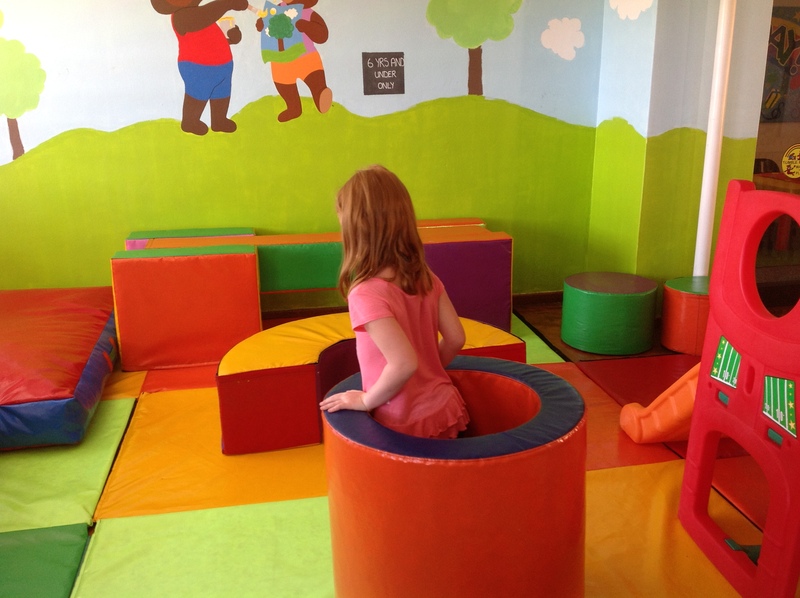 Tumble Bear has a private party room (that can seat 15 kids) and a variety of party packages are available plus a number of optional extra’s. We are sure this is going to be a very popular part of their offering, so book early. The venue is open from Tuesday to Saturday from 10am to 4pm. 2 hours play. Basic decor as above. Add in a party pack, plate and serviette. EXCLUSIVE PARTY Hire out the whole venue for 2 hours for an additional R800. Available on Saturday afternoons and Sunday mornings only. Hi there what does your party 1 consist of? All info is now on our VENUE hire page.